JetBlue yesterday announced the launch of flights to London from both Boston and New York. The airline hopes to disrupt the transatlantic market, in much the same way as Norwegian. Part of this strategy includes low JetBlue Mint fares while using some of the most efficient aircraft in the sky. Simple Flying first reported that JetBlue was considering flying to London back in November, when reports indicated the airline was attempting to secure landing slots at Heathrow. However, with the announcement now confirmed, how will the airline disrupt the transatlantic market? Simple Flying investigates. JetBlue operates a service from New York to Los Angeles, which comes in at around 1,000 miles shorter than the flight from New York to London. 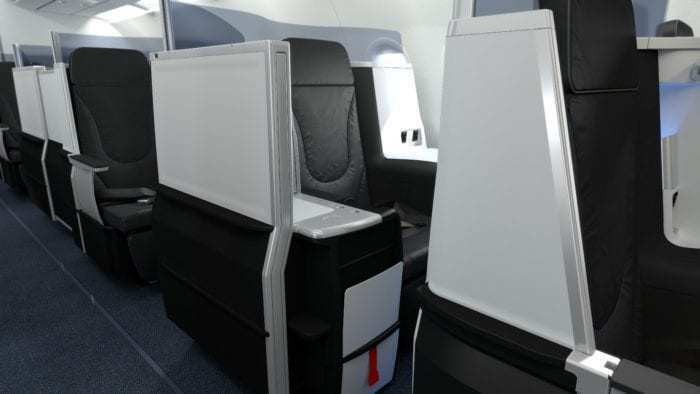 Both services will offer JetBlue’s Mint service, which is essentially a business class cabin. While prices may differ between the two routes when London services commence, it gives us a good starting block. The cheapest business class fares available between JFK and LAX with JetBlue retail at just $599. For this price, passengers get access to a range of benefits including a lie flat bed. These seats are currently offered on select coast to coast and Caribbean flights. Currently, the cheapest non-stop business class flights between London and New York’s JFK come in at $7,098. This is over ten times the fare which JetBlue is offering between the two US coasts in Mint. As the new route is an additional 1,000 miles, it is likely that it will cost more than $600. However, if JetBlue can maintain the fare model currently in use to the west coast, business class travel could suddenly become much more accessible. In fact, fares would likely be closer to Norwegian’s premium cabin, which is much cheaper than a full-service carrier’s premium economy cabin. Will carriers like La Compagnie be affected? La Compagnie currently offers business class only flights between Paris and New York, while British Airways offers a daily business class flight between London City and New York. With ultra cheap business class fares, these services could be affected, however, the effect is likely to be somewhat unnoticeable. Typically passengers who book onto business only connections do so for the convenience of the flight, and for the business focused aspect of the service. There is a possibility that those who are not so concerned about the all business aspect or the convenience of a city centre airport may be drawn away. However, the real impact will be on carriers such as Virgin Atlantic and Delta who are offering a worse product (premium economy) for a much higher price. When the fares between London and New York are revealed, we will, of course, get a greater insight. Would you fly with JetBlue between London and New York? Let us know in the comments down below. Will they be doing US pre-clearance in Shannon (SNN) like BA1? It’s on the way and a great time-saving for the passenger.